Are you unemployed, under-employed, or in a toxic work situation? If so, pray this prayer to find a new job and watch God move on your behalf! Many folks in our community have mentioned their need for jobs over the years. The blessing of the Lord makes one rich, and He adds no sorrow with it” (Proverbs 10:22). where you can be a witness for Him. He also wants you to have a job that will be good for your family. A job that will be safe. A job where you will be honored and respected. A good job is a blessing from the Lord. 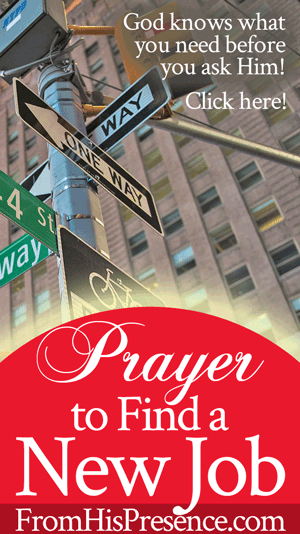 And if you need a new job, don’t hesitate to pray for one–and pray specifically! Yes, you will still have to do the legwork to find your new job. You will have to be diligent to look for the job the Lord has for you. You will have to fill out applications and interview. You will have to work hard at any job you get, go through training, and do everything else that comes with jobs. But the Lord can and will bless you with a wonderful job if you will pray and believe Him to do so. Are you ready to pray? Use the sample prayer below, and add your specific points to this model prayer as needed. Related: Read my whole Radical Prayers series here! “Heavenly Father, I come before You in Jesus’ name. Father God, thank You for hearing my prayer. Thank You that Your Word says “Before you call, I will answer,” and so You have answered me even before I finish this prayer. Thank You for knowing everything that concerns me, and for providing all my needs richly. I know I can depend on You, Father. Father, I lift up my job situation to You. Lord, I ask right now in Jesus’ name that You would make a way for me to have a new job, a better job. Show me which steps to take. Lord, if I am to change careers, then please show me what career to pursue. If I am to stay in the same career, give me peace about that. Either way, Lord, I ask right now that You would bring me into a job where the people are good to work with; where they are nice to me and others. Provide a job where I am paid well, where my work schedule would bless and not harm my family. Father God, I ask in Jesus’ name that You would highlight in my mind where I should apply for new jobs. Give me the motivation and inspiration I need to apply, and shine Your light of favor on me there. As I apply, give me the words to say and help me fill out the application perfectly. Father, I ask also that You would give the interviews that You want me to have–with the right interviewers too. Make it so that, when I walk into the room to apply or interview, the people there would know that I am the one to hire. Be the answer of my tongue, and help me to speak the words during the interview and application process that You want me to speak. Father, I ask You to provide a good salary, good retirement benefits, good medical and dental insurance, disability insurance, paid time off, paid vacations, and paid sick leave. Provide for the on-the-job training that I need. I ask also for Christian co-workers in the workplace; and for kind, compassionate, generous, and patient supervisors. Father God, give me wisdom, strength and power. Reveal Yourself as the Glory and Lifter of my head. In the Name of Jesus I declare that the old things are past and the new things have come. Bring me out of the old place, and into this new place of abundance. Put me in the right job, and deliver me from the wrong jobs. Thank You, Father. Thank You for hearing and answering my prayer, and that I have received everything I’m asking You for. I give You all the glory. If you just prayed this prayer, please leave a comment below so others in this community can agree with you! Also, please let us know when Papa brings you into the new job you have prayed for! I have prayed for me to be what He wants me to be. I was hoping to work from home for a while, I don’t know if that is best though. I have my children’s books, met a lady who is an agent for well known ministers, she doesn’t do that though, and getting an illustrator is expensive. I know He opens and closes doors and I’ll know when to walk through. Praising Him for healing and grace to be able to do the right thing at the right time. Amen.. Thank God, and thank you upon whose heart this prayer was written. May you richly bless the instrument used for this powerful prayer, may they allow you to continue speaking into their heart, and may they always permit you to order your steps. Cover them from every evil, and all theirs. We give Thanks. Praying in faith that God will grant my request today. Thank you Lord, Abba Father, Please be there upon us and all those who seek employment. Help their Families and support them with good health, skill, knowledge, ability and proven knowledge to work honestly with hardwork, always loving you and praising you. I just prayed this prayer and I was just crying before God to help me. Please agree with me for a better job to happen this year. I pray that everyone including myself gains favor in the sight of the Lord that He gives us better than we expect and prayed for. I agree with each one of you in prayer that a great job is coming your way. Praise the Lord. I’ve been filling out applications for a while with very little results. This is so inspirational! Thank you Jamie and God bless you in Jesus name!! Thank you for your continued prayers I pray that you have found a good job surrounded by good people, good pay, good bosses and benefits. I am looking for a better job I am in a toxic work environment it’s a shame because the nurse is a Christian but treated me poorly I decided to resign my boss reassigned me into another position however now I’m working with the other ladies best friend I feel the animosity it’s horrible. IN JESUS NAME I Pray to be rescued from this toxic environment. The prayers are spot-on…thank you Jamie…God bless you. I will return to testify in Jesus name..
God bless you Jamie! This pray is according to the desire of my heart. I pray for the Will of God regarding my job. For peace and fulfilment to God’s Glory.! I have been applying for jobs where I can work from home. I am believing God that I can either edit or teach online. I am going to trust His plan for my life and for my family. I know that this was a divine post because of what I am going through this season. This is the prayers I need most.. And God being who He is will definitely bless me with the best Jobs.. Presently I was treated unjustly in my former job and was dismissed for doing my job, following the companies procedures.. But I strongly have faith in God, cause I know that He is the God that fights for those who have been treated unjustly.. He will surely bless me with the best jobs, and when I look back, all I can say will be thank you Jesus Christ for everything you have done for me. My faith will never get weak… For I trust in His time to do it. saying this prayer this morning, I got an invite for an interview on Friday.. I ask everyone one to join me in prayers for God’s favor and divine intervention and His divine connection. Above all, let His will be done. If the Job is for me, no one will be more qualified than me, but if it’s not His plan for me to have it, I will also accept His plan for me. I’m trusting God to show up and show out on my behalf in regards to my employment situation… thank you for this prayer post, right on time! I have been looking for a job for a while and I need a part time job at the right timing! Please pray for my disabled son (I am praying this prayer for him, too) that he will find a part time job in his new location with the right people who will be kind to him. Thank you for your prayers! Our God who sees all and makes all things beautiful will grant your payers and he will give you the blessings that maketh rich without adding any sorrows. Amen. Thank you for this prayer…I really needed this right now. God bless you in Jesus name…! I prayed this prayer. I have a good job however there are toxic coworkers who act like girls in middle school. They show disrespect and gossip. Plus there is a person holding me back from promoting. I pray for a better job in salary, meaningful duties and opportunity for advancement. Thank you Jamie for on time word and prayer! I just prayed this prayer and trust God for an urgent placement to a permanent job. I had been unemployed since March 2015 and life is really tuff for me now. I need this job ASAP. This prayer has come at a time when I have been searching for a job. I have gone on job interviews, sent resumes and even gone to job fairs and to no avail nothing has come about. It has become frustrating looking for a job but I must keep my faith strong and wait for the Lord to say this is the one. This prayer will be read everyday until I find a job. Good is trul y a good God. I am praying this prayer for my husband, his job was made redundant.We are trusting God for a new and better job and wisdom throughout this time. Our loving Father has never let us down, He is a keeper of His promises. Indeed I’m eternally grateful Lord! Amen and l receive and claim my new job in Jesus’s name. thank you so much Jamie for this powerful prayer. I have to underground an interview tomorrow on how I intend to help my church in finding ways and means to bring the young people to discern and respond to the appelle of God’s to servé His Church. Please help me God to put thé appropriate words in my mouth. Thanking you my God in Jesus’s n’améliore. This prayer came at the right time as I am facing so many persecution and rejection in my present job. All the words in this prayer its like Jamie knew my heart and pour it out loud. Thank you and I believe it is done in Jesus name. I will testify in Jesus name, Amen. Trusting God for a job that he would have me do. In his perfect timing, his will, not my will. Thank you Father, in Jesus Christ’s holy name. Amen. Thank you Jamie for the post. This truly came at the right time for me. I am so unhappy in my current job, and I don’t know what to do. I can’t turn my mind off. I worry constantly. This prayer is exactly what I need. God will help me through this. Thank you for this beautiful prayer! May Papa bless you mightily as you pray for His provision and guidance! My boss had a meltdown today in front of so many people. I and a colleague were targeted and That’s when I realized I needed a new job. This prayer was God-sent. I declare that He will save me from this insane workplace. I’m a contract employee my assignment ends next week I’m praying to God to bless me with a stable job so that I can pay my bills and buy the needed. Nesceitty. I have prayed this prayer for myself and am praying for all who commented and I come into agreement with you regarding your situations. I pray supernatural promotion for us all. Not just “a job” but the best job we’ve ever had and didn’t know possible for us to get! Jamie, thank you! I was praying about this just one hour ago. I open my email and this is in my inbox. Certainly not a coincidence. In my prayer, I told God that I could not hear Him during this dark season in my life. I asked that He would stop the panic attacks that I have on Sunday nights before having to go in to work on Monday mornings. This prayer came right on time. I am now believing for my NEW job in Jesus’ name. Amen! Thank you Jamie. You are such a great blessing to all of us! I pray that our Good Father will continue to bless all you touch and do! Amen. I’m grateful for directing my steps to your website. And praying this prayer is so much a delight in my heart. Thank you. The Lord is certainly good and speaks before I even call. I had just applied online for a job that I really didn’t want but I am qualified to do. After going through a horrific year long drought of my home going through foreclosure and not receiving social security disability, the Lord redirected me to revive my sewing business/ministry, eventually hiring employees. I dare not tell anyone, especially my siblings and my mom because they see it as foolishness. They do not think it is possible to be creative and make a living from it. I have spent most of adult life working to pay bills and being unhappy about what I doing. I just prayed this prayer and it hit home for me in so many ways. I am qualified to be a therapist and I enjoy it but I want to do it on God’s terms as ministry. God has called me to minister to women and children and restore them to their rightful place before the Father. My career objective on my resume states ‘ Provide human services which promote health, education, and well-being’ . In the secular, it stops there. In ministry, it would end with these two words ‘in Christ’. Those of you reading this, please remember me in prayer that this ministry would come to full fruition and soon. Thank you for this prayer. I am expecting so I am grateful for this prayer. Now we all wait with joyous expectation. Believing God to move. Peace to all of us in this process. Much love to all. Wow! Sitting here filling out on-line applications & responding to e-mails & what pops up but a prayer that is spot-on! I was recently blessed with getting my full time hours back at work & a new apartment plus the ability to not pay a deposit for electricity while paying off a debt owed to them – ALL IN ONE DAY! Unfortunately, after just 3 weeks of FT employment, it was taken from me. Now I’m in a nice new home without the known ability to pay for it. So far I’m able to keep making payments and keep my electricity on, but am seeking help on rent. Also have all my worldly belongings including some valuable antique family heirlooms in storage that I may lose if I can’t pay that debt. Thank you for all you do Jamie! Father, for all the people here who prayed thus prayer, may You be the Miracle Worker, the Way Maker, the Giver of every good and perfect gift! Lord, shine your goodness on every person believing for a new job. In Jesus name, Amen. To You, all glory, praise and honor! I’m praying to return to my previous job, because I was unjustly terminated for my personal life. I need my medical insurance in a desperate way thank you. m who is the greatest advocate, and asked Him to turn that dismissal letter to the best employment letter, as a permanent and full staff. I know that He will do it sooner than expected because I strongly believe in Him and in His words. Remain prayerful and positive. Do have a blessed day. I am praying this job for my daughter in law.. I am retired but do little task online will pray God for increase in the task also. I believe God is bringing new opportunities in Jesus name, Amen! I unexpectedly saw this prayer and knew it was for me. Iprayed it and asked God to give me favor to return to a teaching job that I had but was released from. I have an appt. in 2days to talk to the principal. Agree with me that God’s will be done! If He wants me there great but if He has something else for me that He let me know immediately! I want His will to be done not mine! Thank you Father for answering my prayer for a new job, I decree and declare it! This is such a powerful prayer. I pray that God will grant everyone who has prayed this prayer, His perfect will for their lives. Father please open doors of opportunity for those needing it right now in Jesus’ name. The prayer is very encouraging. I am trusting my father in heaven , as he will never leave me nor forsake me. He said that he will never keep unemployed. As I have already resigned from my job and my last day is on January 30th 2018 . This job has been a nightmare and was unable to handle the stress and frustration at the work place. I have come towards his throne of grace for forgiveness and place me in a right job for his glory . Please pray for me. I just prayed the prayer! I have worked almost 19 years in a very difficult situation, which in the past six years has grown increasingly worse. The last three years have been especially hellish and I have left in tears many times, always dreading going back. It is extremely toxic and noxious, and full of unjust, immoral, unethical, petty, vicious, narcissistic, selfish, greedy, entitled, viperous behavior to such a degree I can’t even begin to explain. My heart goes out to all in need of a job and/or in terrible situations. I once again left work in tears yesterday after unjust lies, attacks, and accusations. The stress and strain has been tremendous and has affected my health greatly. Thank you Jamie for this prayer, and I pray that we all hear from the Lord quickly and clearly, and follow His perfect direction. Thank you so much for this prayer! I prayed this for my husband. He is very smart and creative. He has beautiful work ethic but he feels stuck at his current job. he’s been there 14 years but his heart is else where. I prayed this prayer for myself, my son and my step son ? Thank you for this prayer. I am 52, lost my job in March and am up to my eyeballs in alligators. This prayer is encouraging for me. 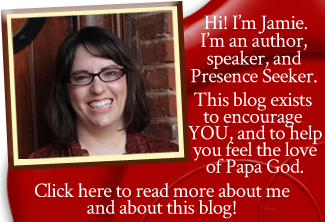 Jamie, your website has been a true blessing to me, my loved ones, and anyone else who crosses my path in need of God’s word, and support and encouragement from like believers. Thank you for this prayer, I just lost my job of 17 years. I am 56 and I am scared that I won’t be able to find anything. I know it was God’s way of getting me out of there because the stress was about to kill me!! He will bring you something better, Rebel! I was let go of my Job on May 15, that I like very much. I wrongly accused by an employee and management believe him. I have been praying that I am rehired back there because I like what I was doing and the people. Amen!!! IN Jesus name I pray ??? Thanking God for all that He is yet to provide to me! Your blog post and prayer for a job situation was just the right one that I needed to encourage me to continue to keep praying to get the right job keeping in mind the work timings to take care of my child at home. I will say this prayer daily and trust in God’s plan for me. I PRAY FOR ALL THOSE SEEKING A JOB THAT GOD WILL BLESS US ALL THIS SEASON WITH HIS IMMENSE LOVE AND INCREASE OUR FAITH IN HIM. AMEN. I prayed this prayer and added job/vehicle/ and a new home. My daughter and I live with my parents still and the environment is not a Christian one. It has been difficult. Everything I have is because God literally brought it to me, gravitated it to me supernaturally. Even when my family is unwilling to help us (we’ve lived in shelters before) God has provided for us in ways that only He could bless us. And even when we used to share with our family of our blessings (we don’t share anymore) they get very mad at us, they call me lazy, they shake their head at me and look down at me and tell me I’m not being a good mother if I keep relying on God to help with everything. And even after all their lectures, when God has blessed my daughter and I with whatever He decides, my family slaps their name to my blessings as though THEYRE the ones who blessed me and without THEM my daughter and I would be hopeless and lost. That’s how we’re represented in our family. We’re considered the weird ones, the outcasts, ‘cause I refuse to let me or my daughter follow the principles of the world. But they don’t see me blessed or finding favor with God, because we don’t have our own home or a car (which broke down after 2 revivals this year. And we JUST got the car in February with my daughter’s survivor benefits from her dad passing last year), and I only make a few dollars over 500 at my job as a teacher aid. Even other teacher aids with no experience or education have asked why I make less than them when they make over $200 more than what I make. I didn’t have an answer for them. A reminder of when facing the impossible GOD continues to rescue us. I was in a horrible job with micromanagers but once when I thought I couldn’t take it he rescued me into another job. At first I thought I could do the job no problem I was in mostly in orientation. Then I shadowed many people on their roles and saw how wonderful it was, now I’m into the actual training and it is not what I expected. My trainer can be rude and straightforward no compassion while I’m training. We have to meet twice a day with updates from our manager sometimes the director will step in and find out status of referrals in a unfriendly way. This is not what I expected I felt that i went from the pan into the fire. Now I’m driving in traffic for an hour each way so when I get to work I’m already stressed out. I’ve been praying and asking GOD to open up another door for me I desperately want out. Please join me in prayer, I wholeheartedly seek JESUS to intervene for me. Please father GOD rescue me from this situation. In JESUS name I pray amen. Thank you for your prayers. May GOD almighty richly bless you! I’ve been praying that God will bless me with a supporting role on a well known Union (Sag/Aftra) tv show. I look forward sharing my testimony when that breakthrough comes my way! Thank you for sharing and for your prayers! I said this prayer and about a 3rd way through I felt this energy. This powerful energy as if the Holy Spirit was present. I humbly, ask that fellow Christians agree with me and others because as the Bible states when two or more gather so is God with them. Thank you. I too need prayers for a job l can do without physically wearing me out. I am a widow, was harassed at my last job so moved back to my hometown with family. Also believing for a nice apt. A space of my own where I can spend more time with the Lord. Love my family but there is constant busyness and little privacy. I prayed now with faith and belief, I quit my 20 yrs job. Now is my self testing time, with Lords help light and guide will take new job. My husband’s work relocated us I was in the perfect job but now I’m struggling to find permanent work we’ve moved 2 times from living stable working in my job for years, I finally found a subbing job as a school nurse I really like it it’s what I’m best at but it’s not permanent I just work when the permanent nurses need time off, we’ve struggled financially that I had to tap into my retirement to make ends meet. I now have zero for retirement but I’m trusting in the LORD Almighy to get us out of this situation we are in esopecially my husband now travels over half the time finding myself alone with my 2 older children one who has a disease called scleroderma again I’m trusting the LORD Almighty for healing and desperately calling out for him to answer my prayers…. trust in the LORD he will come through for us when you least expect it! Thank you for praying with me. God bless us all. Thank you so much for this prayer. My company wants to make my department redundant so I am looking for a new role at the moment. Still going through the redundancy process at the moment. My prayer is that I want the redundancy package to be at least triple of what they are offering and before the notice period is over, I have a wonderful new job at a wonderful company at a wonderful location where I don’t have to pay for additional transportation; paying over and beyond what I ever would have asked or imagined. A company where I am celebrated and not merely tolerated, with compassionate co workers and team leads, training, and other wonderful benefits and packages. Pray that God will have the best job for me according to His will to use me to impact the marketplace, Amen.